Ruby was conceived on February 24, 1993. Ruby 1.8 was initially released in August 2003. Ruby 1.9 was released in December 2007. Ruby 2.0.0 release on February, 2013. 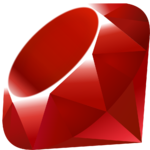 Ruby 2.1.0 was released on Christmas Day in 2013. Works on many Unix-like/POSIX compatible platforms as well as Windows, Mac OS X, BeOS etc. Most Linux distributions either come with Ruby preinstalled or allow you to easily install Ruby from the distribution's repository of free software. Mac OS X comes with Ruby already installed. You can also download and install Ruby on Windows.